Now let's explore another triad. This triad is not quite as useful as the one we've been using so far, but it serves to show how you can take the same approach to any triad you learn down the line. Once we've gone through the basics of it, we'll apply the same techniques as we did with triad #1 and go back and forth improvising with it. Intro: Adding Bass To Your One-Man Band! Sharpest Right Hand In The West! Intros and Outros: Leading In and Out! 2: Electric Rhythm Tools – Vol 1. 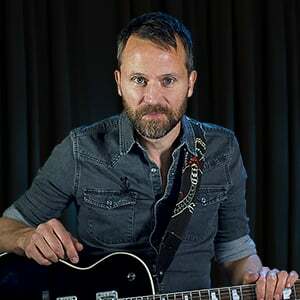 Gear and Tone: Electric Twang! Tic Toc Train Taking Off! 3: Country Lead Tools – Vol 1. Combining Triad #1 and Triad #2! 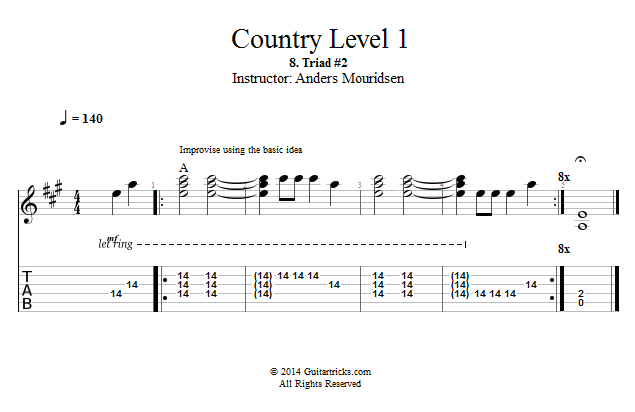 Standard Country Licks Vol 1. 4: Electric Rhythm Tools – Vol 2. Pedal Steel Tone Gear & Tone! The Basic Pattern: E and G! 5: Country Lead Tools – Vol 2. Half Step Below – Let's Try a Lick! Half Step Below – Let's Try Another Lick! Your First Chicken Picking Lick! Improvising With Your First Chicken Picking Lick! Improvising With the New Chicken Picking Lick! Your First Double Stop Lick! Improvising With Your First Double Stop Lick! Extending The Double Stop Lick! Improvising With The Extended Double Stop Lick! Firin' Up An Actual Amp!